Click on the magnifier and learn more about each holiday home, check the price, availability and request a booking. 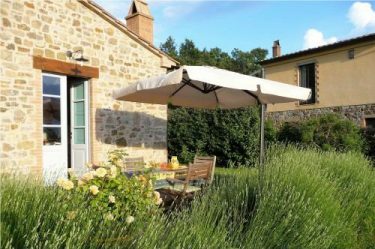 Podere Sant'Angelo is a great place to unwind, escape the stresses and strains of urban life and soak up the tranquility of the beautiful Tuscan countryside. There are opportunities for walking from the property and in the nearby hills. 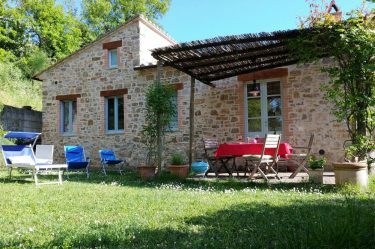 There are Etruscan hill top villages to visit, the beaches of the Maremma coast are just over an hour away and day trips to Siena, Florence and Rome are possible. The English owner is on hand to offer advice and speaks fluent German, French and, of course, Italian. 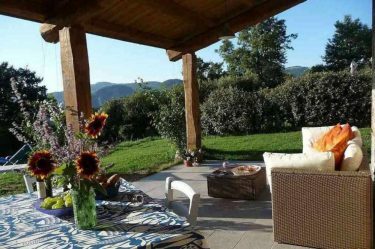 Podere Sant'Angelo is registered with the Tuscan Regional Tourist Board. My partner and I went for our summer holidays. We cooked lots of delicious meals in the kitchen with fresh produce from the nearby supermarket – in Tuscany, even the supermarkets sell the most gorgeous tomatoes, aubergines and potatoes – so flavoursome! We had an idyllic time painting and writing in the garden and slept so well in the huge bed. Would definitely recommend this place for a sublime, rustic escape! The location gave easy access to many charming towns and villages. Siena and Florence were manageable within a day. There were a number of restaurants within easy reach and we had some wonderful food and wine. There are many walks signposted close to Podere Sant’Angelo and we plan to explore more of them next time we visit. It’s so quiet and peaceful all day long (if you would want to stay). There’s absolutely no sound of cars or human to be heard and only the sound of nature is there to enjoy! And then there is Tuscany itself with the beautiful sceneries, fields, trees, hours, landscapes… breathtaking! Traumhaft gelegen mit schönem Garten und gemütlicher Ferienwohnung zum Wohlfühlen. Sehr geschmackvoll eingerichtet, sauber und neuwertig. Ideal gelegen für Naturliebhaber, viele Wandermöglichkeiten. La location è incantevole con tanto verde e una bella vista. Inoltre è tenuta bene e molto curata, bella da vedere e da vivere. E’ un ottimo punto di partenza per andare a visitare i bei borghi e le zone termali che si trovano nella zona. Il proprietario si è rivelato molto cortese e disponibile. Raggiungibile percorrendo una strada sterrata ma agevole. Die Unterkunft ist zwar sehr abgelegen, aber für Romantiker und Entspannung Suchende sehr zu empfehlen.. Graham ist ein sehr angenehmer Gastgeber und für ein nettes Gespräch immer zugänglich. Dank seiner wertvollen Tipps kann man auch in geheime Winkel der Südtoskana vordringen. Really lovely place, surrounded by romantic Tuscany hills. Perfect to spend time relaxing, drinking good wine and enjoying the most incredible starry sky I’ve ever seen!! Also I would like to thank Graham, very friendly and helpful host, who will give you all advice you might need! Definitely recommended! Great traditional food, fantastic wines, beautiful countryside, long hot summer days. Hill top villages, churches hiding renaissance frescoes and ceramics ... sweeping uncrowded beaches with a beautifully clean sea ... all the cliches about Tuscany are here and they're all true - especially in here Maremma, the unspoilt southern part of the region. 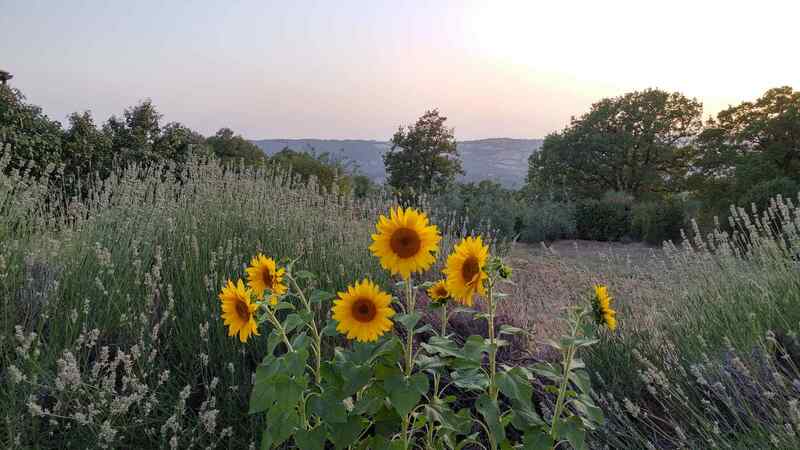 South of Siena, this is a land of Etruscan remains, gently rolling hills, untouched medieval villages with a pace of life that can take you back 50 years if not more.